This 1638 SF ''Cholla'' model has 2 Bedrooms 2 Bath, Plus Den/Sitting Room. 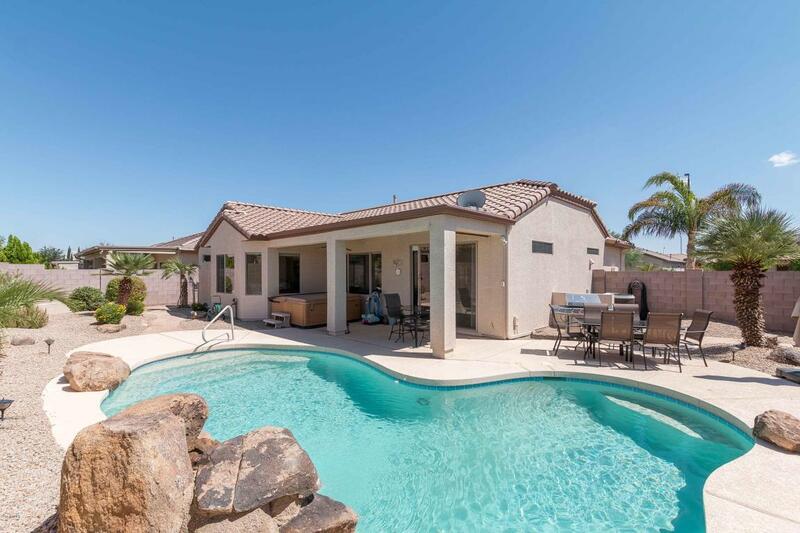 Relax in your private heated pool w/waterfall feature and separate spa!! Home features 18'' diagonal tile, wood flooring in Great Room/carpeting in Bedrooms. Upgraded cabinets, Bay windows in breakfast nook and Master Bedroom, Plantation shutters and Ceiling fans. Extended 22ft Garage w/Epoxy flooring, Storage Cabinets and Service door. Also included is a Whole Home Water Filtration System Plus a Re-circulation Water Pump. Exterior Freshly painted in 2015!! !